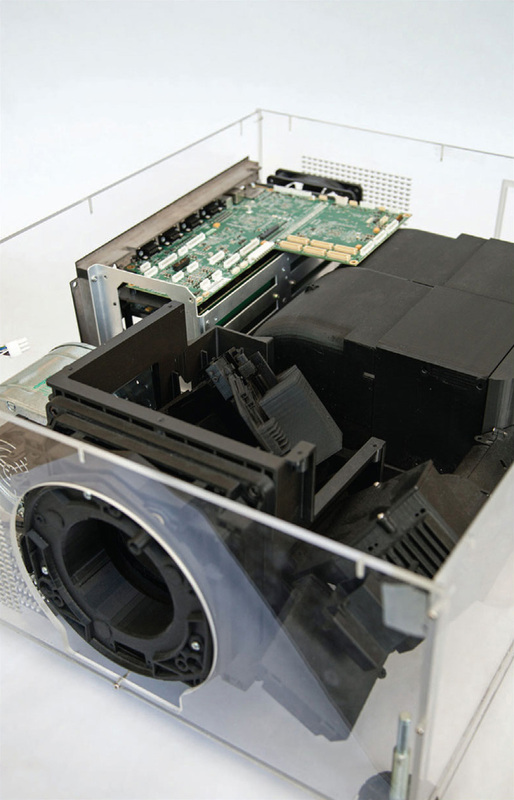 Christie Digital Systems manufactures advanced digital projectors and displays using an innovative prototyping program. The company serves clients in cinema, large-audience environments, 3D and virtual reality, simulation, education, media, and government. This FDM lamp assembly in ULTEM 9085 resin thermoplastic withstands high temperature. Additive manufacturing, also known as 3D printing, lets engineers complete numerous design iterations quickly. For Christie, the speed gains go toward improving products, rather than rushing to market with anything less than a perfect design. Because prototyping needs change as a product’s design matures from concept through functional testing, Christie deploys two distinct additive manufacturing methods from Stratasys®: FDM® Technology and PolyJet™ technology. Christie invested in FDM because it can 3D-print in the same durable thermoplastics found in finished goods, and for its user-friendly interface that makes it easy to operate. The company added PolyJet technology to make finely detailed over-molded parts with rubberlike components. Christie’s M Series projector is one of many examples in which the product development team used both technologies. Early in the project, Christie 3D-printed initial design concepts with PolyJet, which builds parts fast. “At this point, everything is fluid, so having evaluation pieces quickly is a must,” said Mark Barfoot, senior manager at Christie. 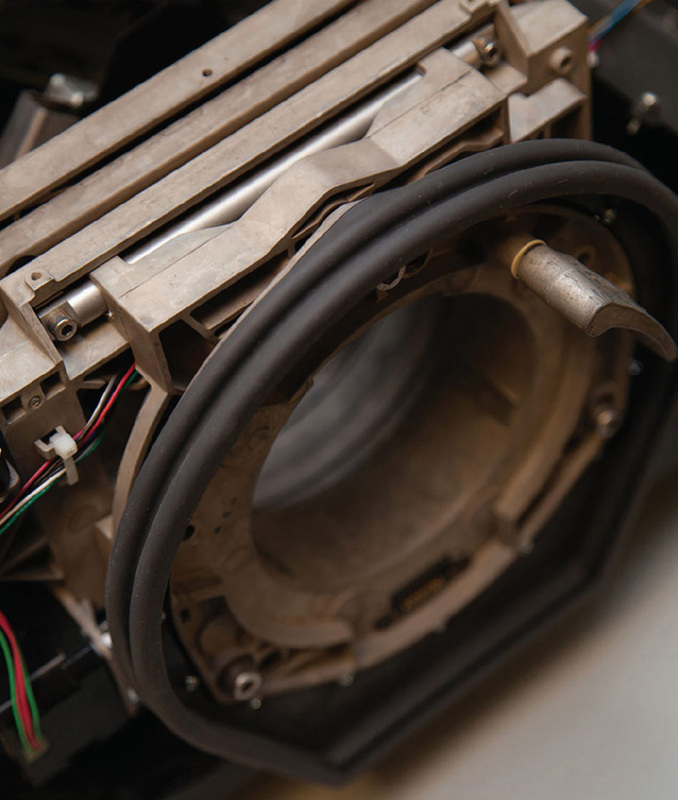 As designs solidified, engineers built an FDM assembly with individual surrogate parts representing everything from air intakes to printed circuit boards, and from optics to a $10,000 light engine. 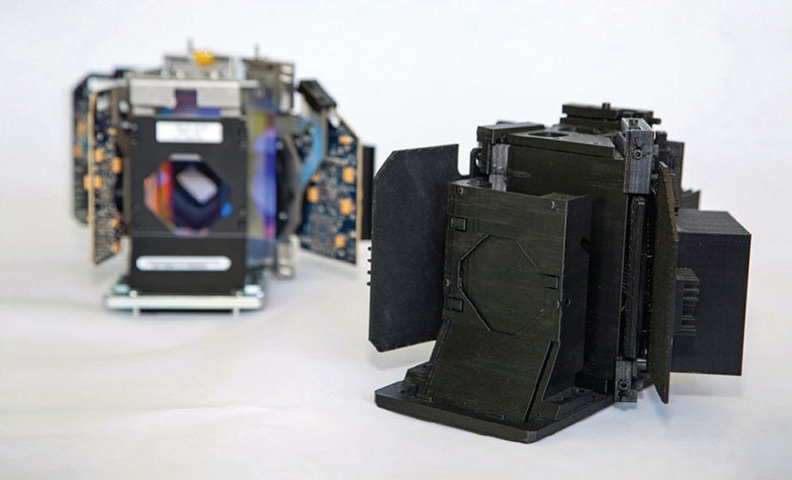 The mockup grew to look more like the finished product as sourced and manufactured components became available, replacing 3D-printed surrogates. The mockup was the baseline communication piece throughout the project, according to Barfoot. Light engine mockup (right) and production unit. The engineering team again turned to PolyJet to evaluate designs of projector components like the overmolded handle, projector keypad, and rubber lens-mount boot. Barfoot said the technology was especially useful in fine-tuning the projector’s remote control with a rigid case and soft buttons that emerge from the Connex 3D Printer all in one piece. Before PolyJet, the remote control would have been rubber molded, at a cost of $2,000 and two weeks per iteration. Christie did three revisions in three days for less than $500. Lens-mount boot with rubber-like properties. FDM was the only choice to prototype the projector’s air exhaust baffle. Its S-shaped path is complex by design to trap light without restricting airflow. Air as hot as 150° C (302 °F) would flow through the prototype, so heat resistance was required, along with geometric complexity. Engineers 3D-printed the baffle in polyphenylsulfone (PPSF) thermoplastic. 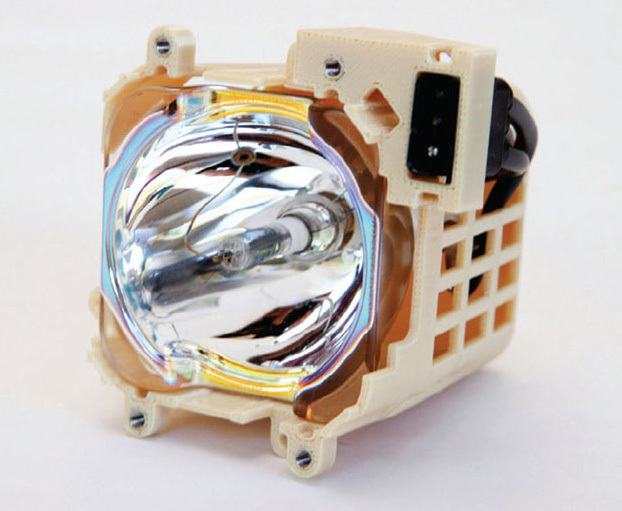 For the lamp assembly, which operates at 120 °C (248 °F), Christie used ULTEM™ 9085 resin. This mockup projector has a combination of 3D-printed and production components. Beginning with the purchase of its FDM Technology-based 3D printer eight years ago, Christie has invested in a variety of resources with the aim of building a state-of-the-art prototyping and environmental testing program. This empowers its engineers to develop the best possible display devices, and Christie is now offering its “build, test, optimize” capabilities to other industries. In the heart of Canada’s technology triangle, Christie’s new enterprise, Hyphen, offers the country’s widest range of prototyping and environmental testing services under one roof. Through Hyphen, Christie shares its methods and technology to give other companies the benefit of its iterative approach to product development. Hyphen also shares Christie’s next mindset change: 3D printing for final part production. Hyphen is looking at direct digital manufacturing for high-end products that have annual shipments of fewer than 100 units.